The Octane Storm XL850 Row is a luxury option with top grain leather upholstery. Adding a home theater recliner to your living room is one of the best ways to enhance your movie watching experience. After you have a plush, comfortable seat with cup holders all you need is the flick and some popcorn to bring the theater to you any night you want. 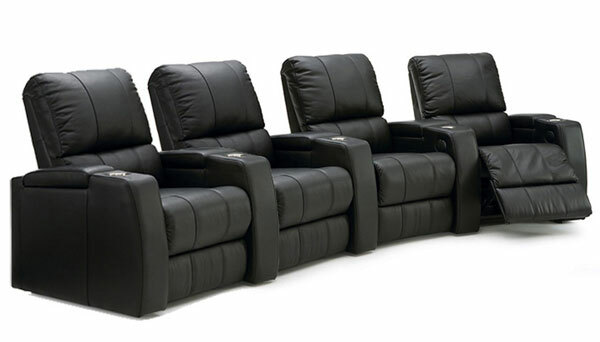 While you can find solo options, many home theater recliners come in sets with multiple seats. A good place to start your search for the perfect seating arrangement is to decide the number of seats that will be best for your space. Most home theater recliners are also imitation leather; there are some genuine leather models put they run for a premium. A handful of microfiber options are available as well. After our search for highly-rated home theater recliners, we have the models in the table below to share with you. We hope the comparisons help you find the right model for your home! Hopefully the comparison chart above is useful in getting a quick sense of the variety of home theater recliners that are available at different price ranges. Below we go into more detail on a few of our favorite models. Unlike the majority of home theater seating options, the Homelegance 9636-2 Laurelton has microfiber upholstery. This unique trait is precisely why we decided to feature it. This set features two oversized recliners and a center console that features a storage compartment and cup holders. A lever on the side of each chair triggers the reclining mechanism. When not in a reclined position the chairs can also function as gliders. The love seat measures 79 inches wide by 40 inches deep by 40 inches high. While most people had very positive things to say about this home theater seat, some reviews state that the chairs are not as durable as they had expected. There are three color options to choose from: Brown, Gray, and Taupe. The Flash Furniture series of imitation leather home theater recliners are beloved for providing a nice seating option at a reasonable price. 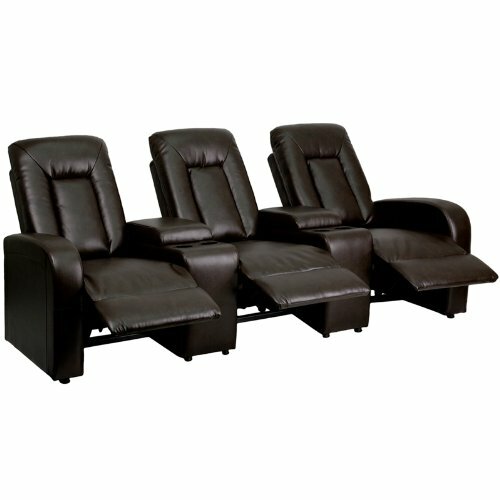 The The Flash Furniture 3-Seat Brown Leather Home Theater Recliner is one of the most popular sets in that series. Speaking of the set’s function, it has 3 seats that are separated by two storage consoles. Each storage console features two cup holders, so there are four cup holders total in the unit. The recliners are push back models that offer multiple reclining options you can adjust the level of recline to your desire. Speaking of the set’s style, it certainly makes an impression. The design features clean lines and a smooth leather finish, making the set look contemporary. This is not often the case for home theater recliners as they tend to be oversized and overstuffed. 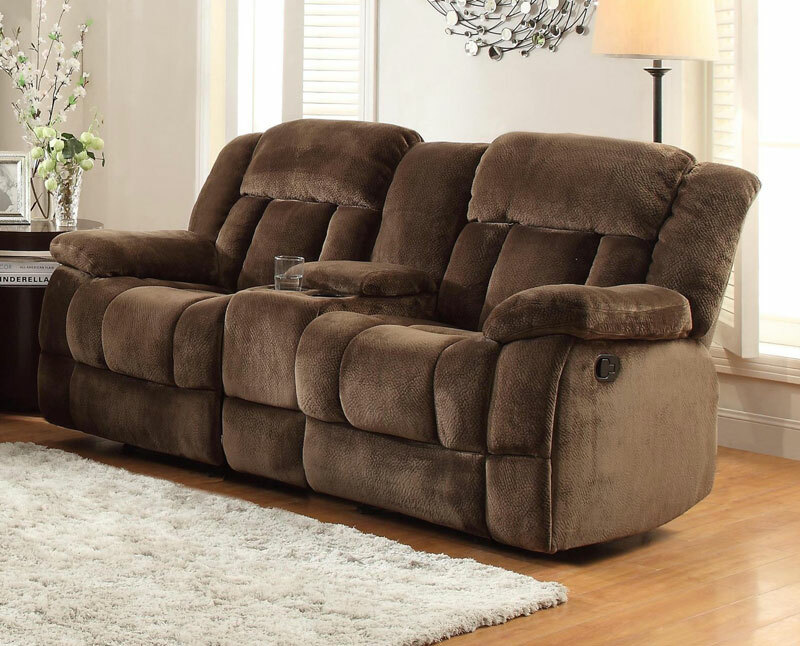 The unit comes in both black and brown bonded leather upholstery. It measure 95 inches wide, 38 inches deep, and 43.5 inches high overall. The Octane Storm XL850 Row of 4 Seats is a luxurious home theater seating option and comes with a steep price tag. Unlike many other models that use faux leather, this Octane Storm model has top grain leather upholstery. It comes in an elegant, timeless black. The chairs were designed to be extra comfortable. They are cushioned by high density foam padding and have a pocketed coil system in the seat core to provide support. The arms of each chair include a storage compartment as well as a stainless steel cup holder. Altogether the unit has five storage compartments and five cup holders. These chairs also have a power recline mechanism. This lets users recline easily by simply pressing a button. When all of these features are combined, one can get a sense of why this set justifies the high price point.